As much as we’re trying to find a new house, we are fortunate to live in the neighborhood we do for now. 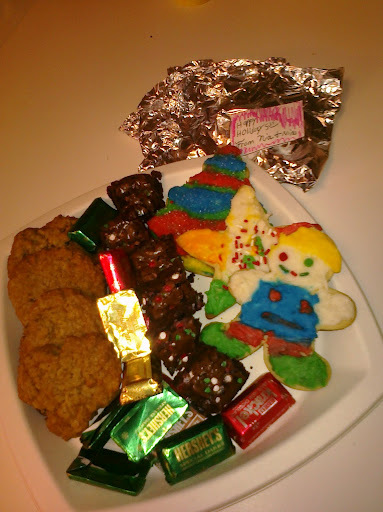 Today our neighbor Nina and her daughter Nia droped off this awesome plate of Christmas treats. It was so nice for them to include us in their holiday rounds, and they have been great to talk to whenever we run into each other at the playground. In a time when a lot of people don’t know ANY of their neighbors, we are blessed to know and appreciate ours. How sweet is that. Looks yummy. How sweet of them. Our neighbors stink. that is so sweet! I wish we had neighbors like that! I hope that we live in a neighborhood where we can be like that with our neighbors! The 2 guys next door to us don't even say hi back when I greet them! Happy holidays! !